How To Learn Typing (Fast) Online At Home On Computer/Laptop – Today on this post on msnTarGet.com media, let’s learn tips of How To Type on Keyboard in the best possible manner. Typing is one of the most important skills you can have in today’s world. Not only the skill but after you have learnt that you can type on Keyboard, You will love to know that you can save literally days year compared to other people because you will be able to type super fast. Now the home keys are – each of the four fingers on each of your hands has a key that it is always going to return to after you type a letter. So for your left hand, the home key for Pinky is A, for Ring Finger is S, for the middle finder is D and for the pointer finger its F.
For your left hand, the home keys are semicolon for the Pinky, L for the ring Finger, K for the middle finder and J for the pointer finger. Now as you start typing and you get used to it, you might develop some shortcuts and maybe some bad habits. So if you will type the letter U with your pointer finger, then You will need to then return to J. If you will type G with your Pointer Finger, then you will need to then return to F. Simply, always back to the home keys. But, as you’re learning to type one of the best practices, is to just start typing letters repetitively, because repetition creates memory and not only in your brain but your fingers will start to remember where things are and then you won’t even have to think about which key you are typing. And, you could talk about F R F F R F. Now, before you go any further, I would like to show you which fingers are responsible for which keys. On this page only, a chart will also be attached which will ultimately help you to tell which fingers are responsible for which keys. Your Ring finger is responsible for W, S, X. Middle finger is responsible for E, D, C and then pointing fingers for R, F, V, T, G and B. On the right-hand side, your Pinky Finger is responsible for P, Semicolon. Ring finger is responsible for O, L and period. The middle finger is responsible for I, K and comma and then your pointer finger will be responsible for U, J, M, Y, H, N.
Now, it’s equally important to understand, when you first start typing, your pointer finger is probably not going to be too tough to learn that one. But your ring and your Pinky fingers are going to feel very awkward and it’s just not going to go well. What you need to work through that because you need to learn that the more you practice, the better you are going to learn. And, if you’re really quick and pointer type, when you first start typing the right way, you actually might be able to type faster with your pointers and you are going to say Oh, screw this. I don’t want to do this because I can type way faster using the way I have been doing it. But, the truth is that you will not be able to type that much faster if you do it the wrong way. And, first, you might be a little slow, because you are not used to it, you need to practice it. It’s not going to happen overnight. But, if you practice this, and you keep doing your repetition, R-F-R-F-V-R-F-V, then you will become very good at typing. Another thing you want to know is to go ahead and check the chart that we will give on this page very soon. Stay tuned with soas.in media, till then. You will need a keyboard or typewriter, patience, time to practice and internet access. Here, step 1: Position on fingers on the Keyboard. Put your little-left finger on the “A” and your right little finger on the semicolon. Lay your fingers one at a time on each consecutive key and place your thumbs on the space bar. The F and J keys on most keyboards have small bumps to easily identify where you two pointer fingers should stay, without having to look down. Step 2: Learn what fingers controls which keys. The left index fingers control the F, G, R, T, 4, 5, V and B. The left middle finger controls the D, E, 3 and C.
The left ring finger controls the S, W, 2 and X. The left little finger controls the A, Q, 1, Z and Shift. Step 3: Learn what keys the finger on the right-hand type. The fingers on right right hand control the same patterns of keys that you’ve learnt on the left side. Step 4: Press the space bar with your right parm. Step 5: Master the shift keys with your little fingers press the shift key while simultaneously pressing the letter of choice to type a capital letter. If the letter is pressed by the right hand, use the left shift key and vice versa. Step 6: Sit up straight with both feet on the floor. Position your chair and keyboard so your arms are at a 90-degree angle and a parallel to your legs. Keep your elbows next to your body and your head straight. Try not to look down at the keyboard or keys. Step 7: Practice typing. 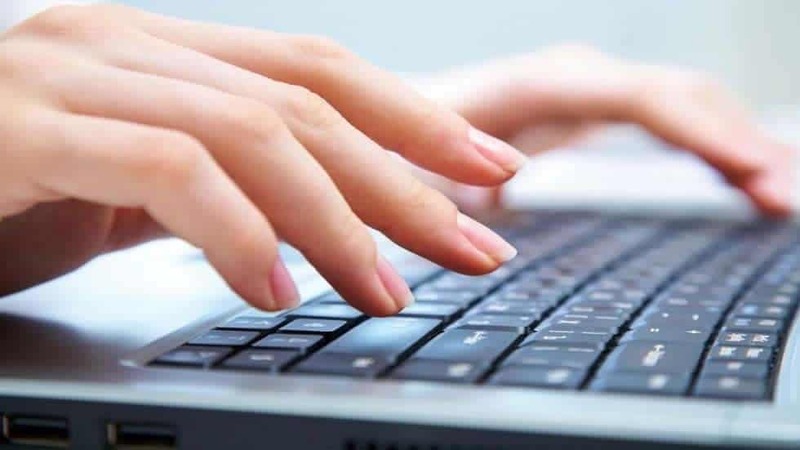 You can learn for free online by visiting websites with touch typing tutorials. Learning the art of typing will save you tons of time over the hunt and peck method. Did you know the letters on the old typewriters used to be listed alphabetically? In the late 1800s, Christopher Latham Sholes rearranged the keys to prevent jamming.